HONG KONG: Asian markets mostly rose Monday following another record close on Wall Street, while oil prices fell after Iran struck a deal on its nuclear programme that will see eased sanctions on the oil producer. The generally positive sentiment sent the yen sinking against the dollar, while it also hit a four-year low versus the euro. Tokyo jumped 1.54 per cent, or 237.41 points, to 15,619.13, its highest close since May 22. Sydney gained 0.32 per cent, or 16.9 points, to 5,352.8 and Seoul added 0.49 per cent, or 9.75 points, to close at 2,015.98. However Hong Kong ended virtually flat, edging down 11.83 points at 23,684.45 while Shanghai lost 0.47 per cent, or 10.26 points, to end at 2,186.12. Traders took their cue from New York, where the S&P 500 ended above the psychologically important 1,800 level for the first time Friday. The Dow also closed at another record high, a day after it broke the key 16,000 level. The S&P 500 added 0.50 per cent, while the Dow climbed 0.34 per cent and the Nasdaq rose 0.57 per cent. The Dow has closed at new records 41 times in 2013, according to data from S&P Dow Jones Indices. On oil markets Brent prices tumbled more than two per cent after Iran on Sunday agreed to curb its nuclear programme for the next six months in exchange for limited sanctions relief. The deal, a preliminary accord laying the foundation for a comprehensive agreement, was reached after marathon talks in Geneva between Iran and the so-called P5+1 nations comprising the United States, China, France, Britain, Russia and Germany. Brent North Sea crude for January delivery fell $2.33 or 2.10 per cent to $108.72. New York's main contract, West Texas Intermediate for January, was down $1.37, or 1.45 per cent, at $93.47. �Brent had rallied last week in response to market talk that the negotiations weren't going so well, and what we see right now is a downward correction of prices after the deal,� Victor Shum, managing director at IHS Purvin and Gertz in Singapore, told AFP. However, he added that despite the falls Monday the impact of the deal on global supplies would be limited since many of the sanctions on Iran would remain in place for now. 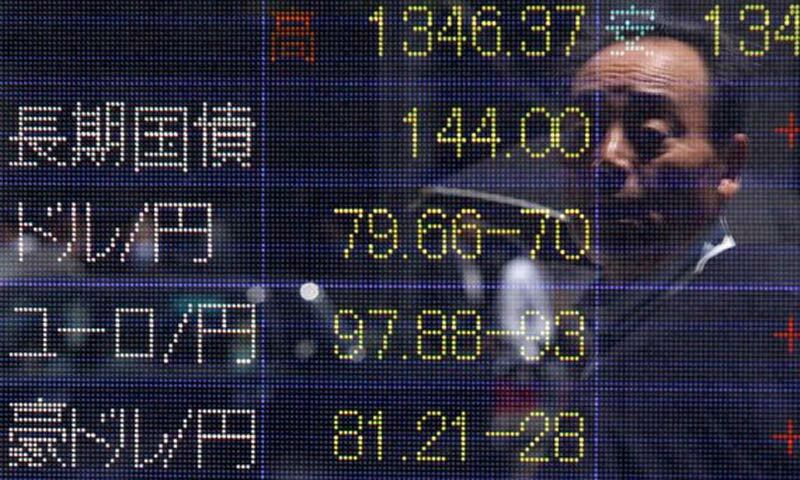 The yen came under further selling pressure on Monday as investor confidence in the global outlook improved. Traders generally move into the yen in times of economic uncertainty as it is considered a safe bet. In afternoon trade the dollar was changing hands at 101.78 yen compared with 101.23 yen in New York Friday. The greenback last week topped 101 yen for the first time since July. The euro was sitting around a four-year high at 137.80 yen compared with 137.21 yen in New York, while also fetching $1.3537 against $1.3555. Gold fetched $1,232.50 per ounce at 0810 GMT compared with $1,242.80 on Friday. In other markets: � Taipei rose 0.87 per cent, or 70.73 points, to 8,187.51. Taiwan Semiconductor Manufacturing Co climbed one per cent to Tw$101.0, while leading chip design house MediaTek was 0.94 per cent higher at Tw$428.0. � Wellington closed flat, edging down 4.12 points to 4,813.88. Fletcher Building was off 0.11 per cent at NZ$9.32 and Telecom fell 0.43 per cent to NZ$2.29. � Manila slipped 1.32 per cent, or 80.58 points, to 6,004.26. The index has lost about seven per cent of its value since the Philippines was devastated by Super Typhoon Haiyan on November 8, as traders grow concerned about its economic impact on the country. Philippine Long Distance Telephone Co. fell 1.57 per cent to 2,630 pesos but Metropolitan Bank and Trust Co. rose 0.47 per cent to 74.75 pesos.